The HICMR web based Infection Prevention and Control (IPC) Management System is available via the HICMR website at www.hicmr.com.au. The Web based system allows HICMR clients exclusive and expedient access to HICMR Policy Manuals, Toolkits, and resources. 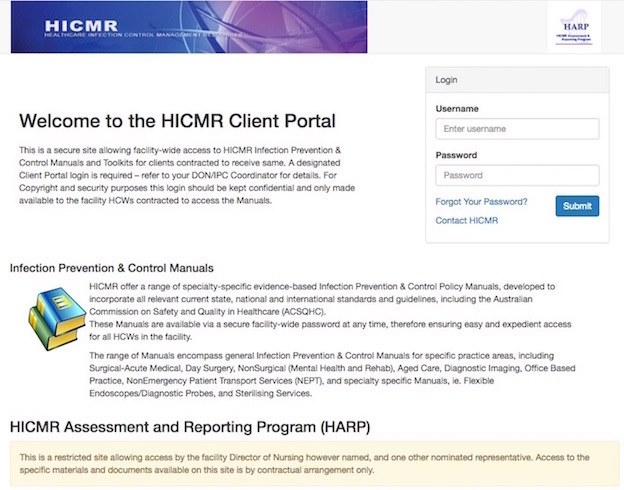 The HICMR Client Portal is the only way to access Policy Manuals and updates. Provides general access to information about HICMR products and services. This is a secure site allowing healthcare facility (HCF) wide access to HICMR IPC Manuals and Toolkits for clients contracted to receive same, ensuring timely and expedient access by all healthcare workers (HCWs) within the HCF as required. A designated Client Portal login is provided. The Client Portal enables HICMR to update Policies efficiently and expediently in accordance with changing standards and practices. Newsletters and Information Sheets are also available. This is the only way to access HICMR Manuals and Toolkits. This is a restricted site allowing access by the HCF Director of Nursing however named, and one other nominated representative e.g. IPC Coordinator. Access to the specific materials and documents available on this site is by contractual arrangement only, including Risk Assessment (RA) / Review Reports, Main Risk Summaries, Action Plans and Benchmarking Graphs; Blood and Body Fluid Exposure Incident (BBFEI) Reports; Client Portal Login Reports; and Internal Audit / Practice Audit (IA / PA) Tools. There are 2 HARP Registrations allocated per HCF. The Registrants will also be added to the HARP email list and will receive regular communication, Newsletters and updates from HICMR. Practical, current, evidence-based risk minimisation strategies for effective Infection Prevention and Control (IPC) Outcomes.